Over the last several years, jobs in trucking have become plentiful. A driver shortage has led to a surplus of trucking jobs that need to be filled with talented drivers. Solo drivers are paid at a higher rate per mile, but are restricted to less miles due to hours of service regulations that limit the amount of time a driver can spend behind the wheel each day /week before taking required breaks. Team drivers are paid at a lower mileage rate, but often times end up earning more money in the long run as they are paid for every mile the truck drives, not just the ones s/he drives. Team drivers are both paid for the total miles the truck drives, so when one driver’s shift is up, the next steps in and takes over and the team splits the pay from those miles. We’ll give you a little example. Driver A is a solo driver earning a mileage rate of .28 and drives an average of 2,500 miles a week. His gross income is $700 for the week. Driver B is a team driver with a mileage rate of .175 and an average of 4,600 miles a week. Driver B takes home $805 gross. See how it works? 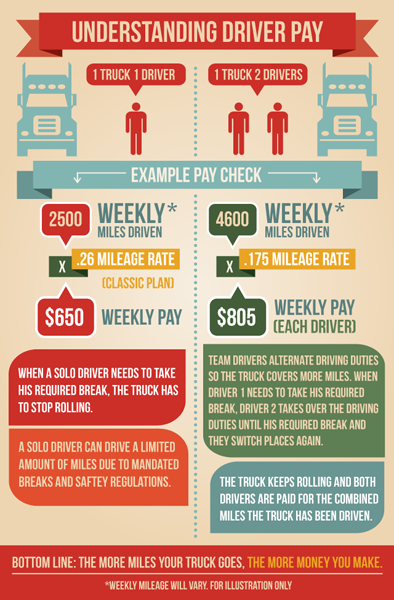 Learn more about truck driver pay here. After getting some time in over the road, many drivers go on to pursue other jobs in trucking like dedicated or local routes that allow them to spend more time at home. After a year or so as an over-the-road driver, these more in-demand positions begin to become available. Following some years as an over-the-road driver, many individuals decide to give back and become a driver mentor to help other aspiring truck drivers learn to ropes. As one might imagine, this comes with a great deal of responsibility and can be highly lucrative over time. Similar to the mentor jobs in trucking, some drivers decide to teach at a truck driving school. Like the mentoring jobs, this is a good option for those who are natural teachers and want to help others get started in the trucking industry. Many choose to go for a truck driving school instructor position to have more nights and weekends at home. You’ve probably heard it said before, but sticking around in your first trucking job for a year or two can greatly benefit your future job opportunities. It allows drivers to get some experience and first hand knowledge that undoubtedly looks good to future employers. It shows companies that you’re dependable, dedicated, and knowledgeable and reassures them that you won’t jump ship the moment things get tough. Are you interested in starting a job as a professional truck driver? The Driver Solutions CDL training program is free when you drive for one year with a sponsor company. Simply fill out our online application to get started. Give us a little info about yourself, and after you complete the app, you’ll be able to schedule a time to chat with one of our driver representatives about your job options.